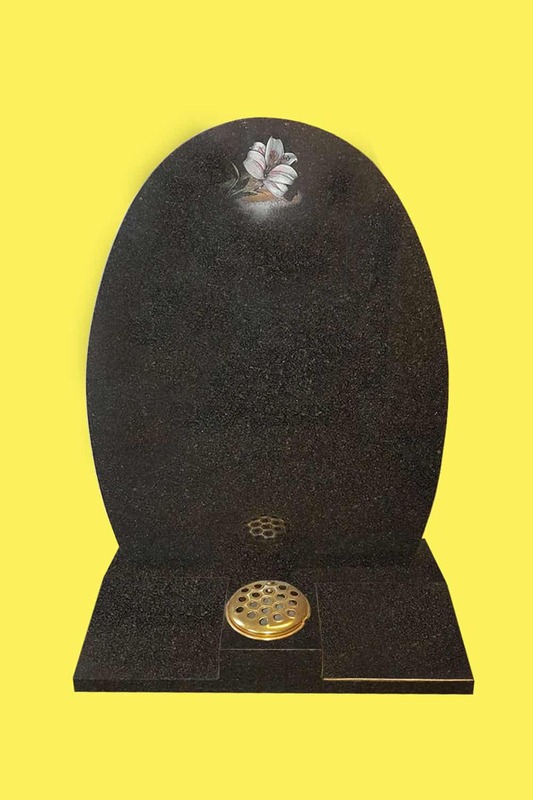 Beautiful elliptical shape cemetery memorial headstone in dark Grey polished granite with hand painted star Lilly design. Double splayed base with centre vase hole. Cemetery memorial headstone in dark Grey polished granite with hand painted star Lilly design. Double splayed base with centre vase hole. 60 free letters in silver. Base 24″ wide x 12″ deep x 3″ high. £1497 (SAVING £500) inclusive of VAT, plus cemetery fees as appropriate. Pam has been in the stone industry for 15 years and loves her job. She specialises in getting people's memories into stone and loves working with the public. Donated by us for Help for Heroes charity. ©2008-2018 A. Clarke Memorials. All Rights Reserved.